Organizers are expecting about 120,000 people over the three days of the event. Cabin: Twelve indoor talks in the Gwynne’s rustic cabin will cover topics such as producing maple syrup, growing plants for pollinators, deciding when to harvest your timber, turning your yard into an edible landscape and managing edge habitats for wildlife. Wildlife and aquatics: Sixteen sessions will feature, among other things, bats, native bees, attracting birds, keeping out deer, aerating ponds, chronic wasting disease in deer and preventing harmful algal blooms in ponds. There also will be a demonstration of electrofishing in nearby Deer Creek, a technique that scientists use to sample the fish that live in a lake or stream. The fish, briefly stunned, are netted, counted, measured and safely released. A similar demonstration at last year’s Review netted smallmouth bass, sunfish and others. Forages and grazing: Ten talks will look at topics related to raising farm animals on pasture, including summer grazing, year-round grazing, grazing cover crops, warm-season grasses and prairie grasses’ benefits for livestock and quail. Woodland: Mushrooms, tree identification, trees and taxes, and the future of elm and ash trees will be among nine talks in the Gwynne’s Woodland Amphitheatre. Nearby, you can visit pollinator plots, several hardwood plantings and a planting of native pawpaw fruit trees. Chainsaw demonstrations will show safety, sharpening, maintenance and cutting techniques. Also in the Gwynne, visitors can check out demonstrations of the National Archery in the Schools Program from 10 a.m. to 1 p.m. daily; and high school students can see demonstrations by CFAES’s Department of Agricultural Communication, Education, and Leadership beginning every half hour from 10 a.m. to 2:30 p.m. daily. The Gwynne is reached by riding any of the free shuttles that board at the west end of the Review’s main exhibit area near the Fendrick Headquarters Building from 9 a.m. to 3:30 p.m. They’re the same shuttles going to the Review’s popular field demonstrations. The full schedule of talks and demonstrations in the Gwynne and a map of the area are included in the free event program handed out at the Review, or you can find them in a PDF available at go.osu.edu/CXEN. There’s a green oasis on the Review’s main grounds, and it’s called the Utzinger Memorial Garden. Located near Friday Avenue and Market Street, it grows flowers, vegetables, fruit trees and more, and offers tips and ideas for doing just that. This year, organizers have added gourds, sunflowers, dwarf fruit trees, a lavender bed, a patio, a shade bed and root vegetables growing in raised beds, which are designed to be accessible to gardeners with disabilities. Master Garden Volunteers trained by CFAES’s Ohio State University Extension outreach arm will be available throughout the garden to answer questions. Members of the West Central Ohio Beekeepers Association will be in the garden, too, giving tips on how to get started in beekeeping and showing the basic equipment needed. 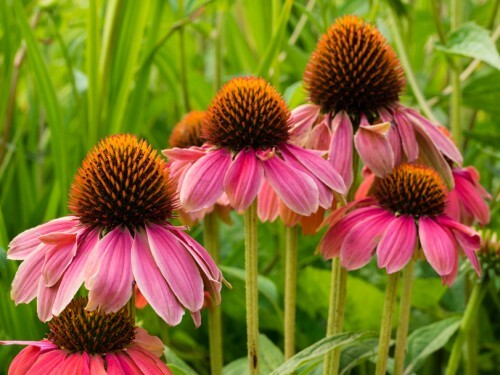 There will be “Gardening Through the Lifespan” signs throughout the garden, put there by specialists with OSU Extension’s AgrAbility program, sharing tips for gardening with disabilities, limited mobility, arthritis, or simple aches and pains. Tuesday: You can hear about, among other things, gardening in small spaces, easy ways to monitor your garden soil, coping with pests such as ticks and mosquitoes, and the “Gardening Through the Lifespan” program. Thursday: You can learn, for example, how to attract hummingbirds and butterflies to your yard and how to use small trees and shrubs in your landscape. Find details about the Utzinger garden, including the complete schedule of talks, in the event program. Tickets for Farm Science Review are $7 online, at participating agribusinesses and county OSU Extension offices, and $10 at the gate. Children 5 and under are free. Hours for the event are 8 a.m. to 5 p.m. Sept. 18-19 and 8 a.m. to 4 p.m. Sept. 20. For more information, visit fsr.osu.edu.